Set against the backdrop of the distinctive Sugarloaf hill, this expansive eighteenth century garden surrounds a Palladian mansion with tree plantations that frame the vista from the house. Located just 20km south of Dublin, Powerscourt is rated third in the world’s top gardens to visit by National Geographic. Renowned for its impressive fishponds, cascades and seasonal gems like the Rose Garden, the garden also boasts an outstanding Japanese Garden, which looks amazing in spring when it is awash with fragrant azalea blooms. Take time for a leisurely stroll along its winding paths; stone lanterns guide the way and there are brightly painted bridges to cross over that take you to the hub of the garden, where you’ll find a ring of Chinese Fortune Plants. High above the Japanese Garden your efforts are rewarded by a well-positioned stone seat, which takes in a spectacular view. Next to the Japanese Garden are secret pathways leading to one of the oldest features of the garden, an elaborate Grotto made from fossilized sphagnum moss. If you allow 2-3 hours for your visit, there are more splendid walks through woodland. The garden has a noteworthy collection of fine conifers from North America that forms a backdrop for many of the garden’s ornate ironwork and statuary. 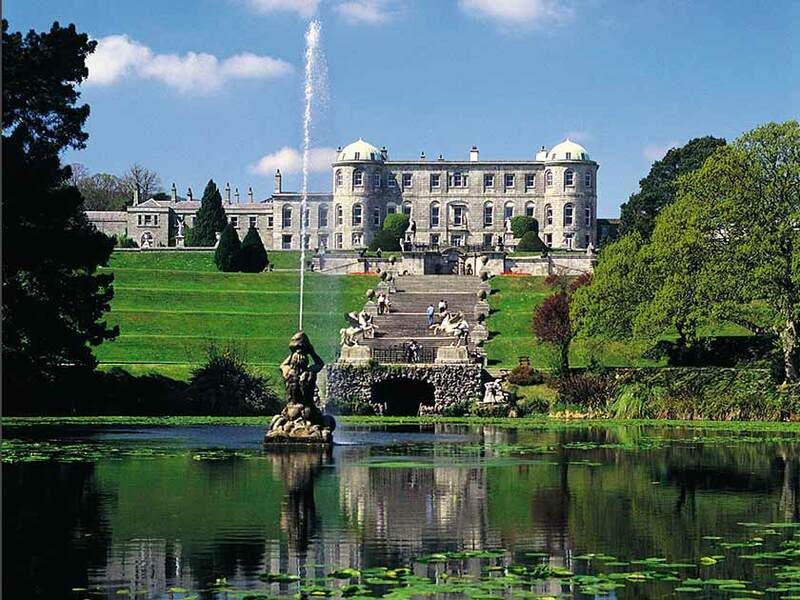 One of Powerscourt’s most iconic features is its ornate Italian Garden, which leads you to a lake and beyond to an impressive walled garden via a huge staircase or series of terraces. Throughout this privately owned garden (the Slazenger family bought it as a run down 14,000 acre run-down estate in the 1960s), there are over 200 plant varieties, many of which are featured in the perennial beds and borders that ensure that Powerscourt is a garden for all seasons. This Galway gem takes you on a magical journey into the heart of Celtic heritage and mythology. Set in 11 acres of native woodland and wildflower meadows, its winding nature trails make it one of Ireland’s top gardens to visit for a family day out, but there’s also an ancient ring fort (fairy fort), a crannog (Iron Age style roundhouse), and Ireland’s largest calendar sundial. Four separate gardens take you on a journey through the mystical cycle of the year, with each representing one of the Celtic festivals. The Samhain Garden (Halloween, which begins the yearly cycle for Celtic people) has a still pond with a long bank in the shape of a sleeping woman. It’s a tranquil place, so take time to reflect. The Imbolc Spring Garden represents re-awakening and is approached through a pretty wildflower meadow with blossom orchard trees. At its hub is a sunken garden that is symbolizes Brigit, the pre-Christian goddess of the land. Next, the Bealtaine Garden welcomes the coming of summer’s warmth and features stone pillars that the represent flames of this Celtic fire festival. 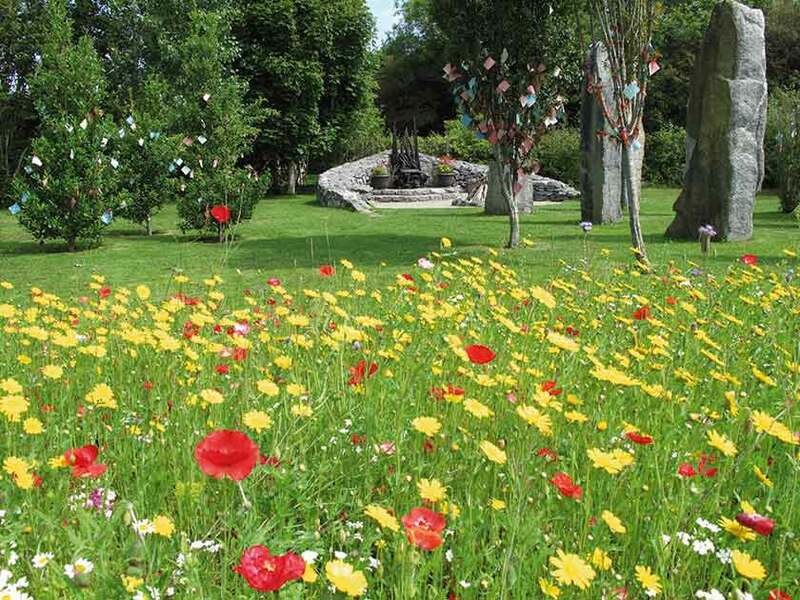 At its centre is a grassy hollow planted with wildflowers facing the sun – a good place to lie back and dream! The Lughnasa Garden marks the transition of summer to autumn. It’s a time for celebration, so has two interlinked stone circles making spaces for feasting and dancing, which almost force you to bring out your inner child! Three yew trees stand outside the exit of Lughansa, symbolizing the moment of death, completing the circle of life. Whatever the season, there’s always something new to see at Rowallane, which makes it a fabulous garden to visit all year round. 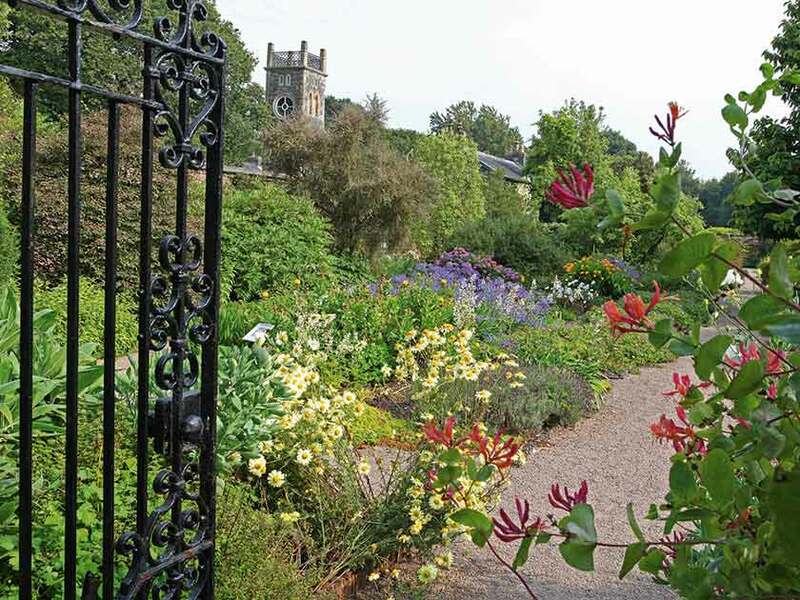 A National Trust garden, carved from its County Down landscape, its makers the Reverend John Moore and his nephew Hugh Armytage envisioned it as a peaceful place when it was created in the 19th century, and their efforts created a mix of formal and informal spaces with many unusual vistas that reflect the beautiful natural landscape. It’s recognized as a plantsman’s garden too, with spectacular plants brought back by hunters of yore from as far afield as China and South America. In spring, the garden is ablaze with rare species of rhododendrons, azaleas and magnolias as well as dainty wild flowers. Watch out for the spectacular handkerchief tree (Davidia involucrata) in May. The notable Rock Garden Wood showcases shade-loving plants, and in the restored Walled Garden there are harmonious formal plantings of herbaceous plants, shrubs and bulbs to admire. Laid out in the shape of a Celtic cross, the Walled Garden wakes up in spring when it puts on its show of blue poppies (mecanopsis). In summer, visit the fascinating herb gardens, where the plants rub shoulders with salad leaves and runner beans, becoming magnets to butterflies and bees. 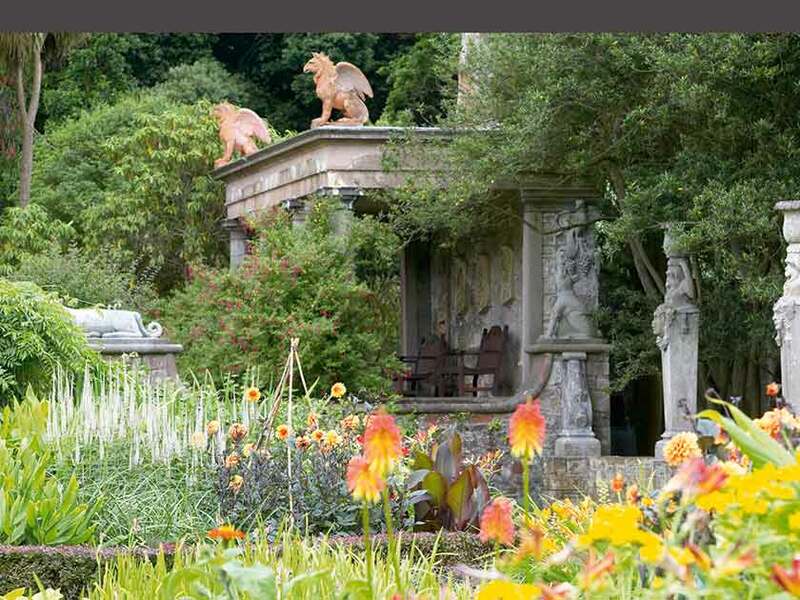 One of the most inspiring and unusual gardens in the National Trust’s ownership, its formal areas resemble an Italian landscape and the informal wooded areas support a range of plants from all corners of the world. Tender plants from across the globe thrive n the mild climate of Strangford Lough, and in spring the rhododendrons are especially spectacular. The painterly planting was the hallmark of Lady Londonderry, who refurbished much of the 17th century garden in the early 1900s. She made the gardens as lavish as possible, drawing on inspiration from her wide-ranging interests in classical and Celtic mythology, Italian Renaissance and Spanish/Moorish gardens, heraldry and her own family, increasing the size of the lake and adding a Sunken Garden, Spanish Garden and Italian Garden. Her playful spirit also revealed itself when she created a menagerie with exotic animals on the Dodo Terrace. The National Trust is currently committed to restoring the historic Walled Garden so that they can save the rose garden and home of one of the oldest grape vines in the UK and Ireland. It’s a ‘White Syrian’ and was planted in 1769. 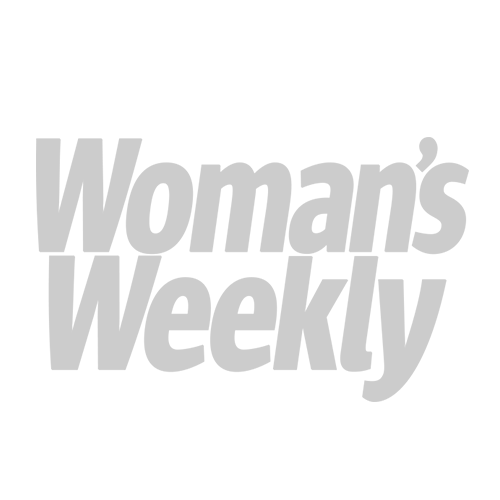 You can make a donation to help support their work. Don’t miss the amazing gardens in Scotland, England and Wales, too!